The Itty Bitty Kitty Committee: Let's Rally! Perhaps you remember this little group of feline fundraisers? Well, it's that time again. On Saturday, July 24th, we're participating in our second annual "Dog-A-Thon Walk for Homeless Pets" to help raise money for The Humane Society of Tacoma/Pierce County. 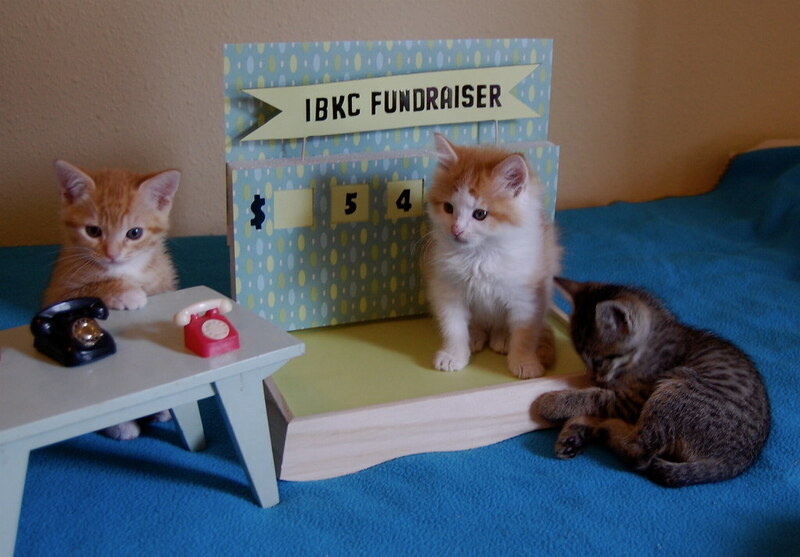 For those who are new to the IBKC blog, last year's fundraiser was just incredible. We started off with a very modest goal of $3000 and in the end, thanks to huge outpouring of love and support from IBKC community members, we raised over $23,000 (23 squillion) for the shelter. It truly was amazing to watch it all unfold. I think all who witnessed it would agree - it was heartwarming and beautiful to see our amazing community rally around this cause. With our donations pooled together, we were able to do some really great things for the cats and kittens. For example, a large portion of the money we raised was used towards the completion of the cat quarantine rooms at the Humane Society (AKA Butterbean Quarantine). You can read all about the good things that have happened since they opened the doors to Butterbean Quarantine by clicking HERE. Last year, as the fundraiser snowballed, I raised our goal multiple times. I thought this year I'd just raise the bar, and start with a higher goal. So friends, this year's goal is 40 squillion (that's $40,000) and after all the excitement last year, I'm feeling confident we can do it. To offer a little incentive, just like last year, we'll have a raffle. Everyone who makes a donation to the fundraiser will be entered into a pool. One lucky person will win the naming rights to one of our Itty Bitty Kitties and will also receive a large sampling of Itty Bitty Kitty cards. Christine was our winner last year, and she named Olly Musselman. There will be a lot of on-line auctions too. We'll be auctioning off the naming rights to our next batch of kittens. We've also got a few lovely art pieces to auction as well. I've got so much planned, so the next five weeks will be filled with plenty of posts and lots of fun and surprises! OH, and a fancy new telethon set! And get this,,,, I bumped into Tressa and Neville Lovejoy's Pa the other day, and his girlfriend was kind enough to send me a picture of little Miss Tressa, all grown up. These little kittens give so much to us. Think of all the times their lovely little faces have brightened your day. Let's say thanks to these kitties by supporting the organization that gave them their start in life, The Humane Society. To show your support and make a donation, just click HERE. Even though it's called "Dog-A-Thon", all of the money we raise, goes directly to the cats and kittens. If you would like to learn more about the Dog-A-Thon, Click HERE. Thank you, friends. I'm so excited to see what we can do this year! I can hardly wait to see the difference we make!!! Wot a wonderful cause ~ we hope yoo do really well. We will stay tuned for noos. Oh, Hubie. All great actors chew the scenery every now and then. Let's get an early start on this one! I just made a little donation and I hope to do it again and again. I will make a donation ASAP!!! :) can't wait to see little Tressa all grown up!!! Come on, everyone, we can do 40 Squillion! Just think of all the happiness the IBKC has brought to us. And Laurie - I like to new layout! Oliver and Minnie were quick to tell me to get on it and post our donation...I think we were first...YAY! so caush about the changes to the site. Donation forthcoming, 'cause I get a squillion dollars worth of every post!! Let's get those A-E's on the phones! Soon as i get paid, i'm in. All right, let's do this! If Charlene thinks we can do $40 squillion, so do I! Woo hoo! Let's do it! A picture of Tressa the torbie? I've been DYING to see what she looks like! Yay! And I have to say, after the last year, I was sure they'd change it to the cat-and-dog-athon. Oh, well.